I’m honored to serve Maine in Congress. Together, we can keep moving our economy forward. U.S. Rep. Bruce Poliquin declares victory over Emily Cain in the 2nd Congressional District in 2016. When I was growing up in central Maine, our neighborhoods and schools were filled with kids. Our paper and textile mills and shoe factories were thriving. There were plenty of good-paying jobs with benefits, right out of high school. Some mills and factories started closing in the late 1970s. Every time one shut down, it devastated the community. I’ve lived through the 30 years of these horrible shutdowns. I’ve never forgotten it. One of the reasons our mills couldn’t make it was because of unfair trade deals. That’s why I fight so hard in Congress for employers like Bath Iron Works, Cianbro, New Balance and our paper mills in Rumford and Jay. In my 35 year career as a job creator, I helped numerous small businesses — hiring, training and supporting hundreds of fellow workers, men and women. I learned firsthand that lower taxes, less red tape and fair trade build a stronger economy with more jobs and bigger paychecks. In my short time in Congress, I’m proud to have successfully fought to stop illegal trade before the International Trade Commission, and winning every time. These victories have protected or saved hundreds of Maine jobs. Our unemployment in Maine is the lowest in decades. There are more available jobs than workers looking to fill them. Our small businesses are growing and hiring. Families are earning more money, and feeling more financially secure. We must continue to go forward, not backward by increasing taxes. My son, Sammy, was born 28 years ago and changed my life forever. It changed how my wife, Jane, and I thought about health care and education, and keeping little Sammy safe. Jane and her father drowned in a tragic accident when Sam was still in diapers. I raised him mostly as a single dad, and we’re very close. Jane and her father’s death reminded me how fragile and precious life is. This hit home when Sam was diagnosed with a pre-existing condition. That’s why I support protections for people with pre-existing conditions, despite the misleading ads that say otherwise. My mother is now 90, having had a successful career as a nurse. My dad is 88 and had a career teaching in the central Maine public schools. I’m my parents’ guardian. They paid into Medicare and Social Security their entire working lives. They depend on these critically important programs. In Congress, I have always, and will always, vote to protect and strengthen Medicare and Social Security; mom and dad rely on it. Again, any ads — largely paid for by out-of-state, dark money groups — that say otherwise are absolutely not true. In fact, I have repeatedly fought to drive down the cost of prescription drugs and the soaring costs of health insurance. We must find a bipartisan solution to lower these costs. You can bet that I’m not giving up. My brother, Jim, was a gentle soul. He passed away a dozen years ago after struggling with addiction for 30 years. Tragically, like so many families in Maine, the issue of addiction and substance abuse hits too close to home. In Congress, I’ve joined the bipartisan battle against the opioid epidemic. I voted to send an additional $4 billion to the states for early education, law enforcement support and more detox, recovery and mental health services. I’m proud to be a member of the House Veterans’ Affairs Committee, giving Maine a direct seat on issues affecting veterans most. I’ve worked with Sen. Susan Collins to make sure our heroes, and their families, can receive their health care closer to home and I will continue to push the VA to make timely payments to our small hospitals so they can stay open, serving our veterans and our local communities. I’m honored to serve you in Congress. I’m asking for your vote on Nov. 6 so together we can continue moving our economy and Maine forward. 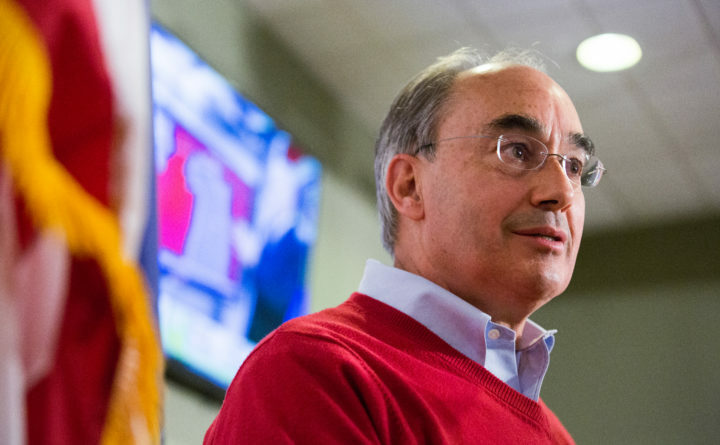 Bruce Poliquin represents Maine’s 2nd Congressional District.